Hello, my name is Steve, (as you can probably guess from the URL,) it's the 21st Century, I like to think of myself as reasonably intelligent, well-educated, literate, with a rational, logical way of thinking... and I'm a Christian. I grew up in a Christian household, my mother being an active local preacher, homegroup leader, and recently she was Vice-President of the Methodist Conference in the UK. So it is far too easy for a critic to say, "yes, but you were brought up that way, and then you've never got around to doubting it - that's not even belief!". As I say, that's too easy, so you'll have to come up with a better one than that. So I was brought up to go to church and say my prayers, which I didn't doubt for many years - as a child, there's so much new stuff to learn all the time, I think you have to take for granted that the sky is blue, grass is green, and Jesus loves me until you're old enough to start thinking about the validity and consequences of these statements. I now have some idea why the sky is blue, thanks to my Physics lessons, a more vague understanding of why grass is green, through Biology lessons, and as to why Jesus loves me - well, that's a longer story. By the time I was about 12 years old, I was in a group discussing heaven and hell, and I decided that I didn't want to spend eternity in hell, so I made a conscious decision to be a Christian. Looking back, that's not a very well thought-out basis for a decision, and shows remarkably little understanding of the character of God. However, it was a start. From that decision, I could explore my fledgling beliefs a little more, and start to get to know God on a personal level. Getting to know God personally, finding out about Him and His character, really is the most rewarding thing of all - better even than getting to understand RFC2317, which, believe me, is a most rewarding, if frustrating, experience! So I spent my teen years doing just that - and I am still learning all the time. It is said that we only use about 10% of our brain... were we to use the full 100%, we would still know only a small fraction of what there is to know about the God who created the Universe. In that time, I learned many things - one being that many credible and intelligent people whom I respected sincerely beleived that there was no God - and that others, equally credible and intelligent, just as sincerely claimed that there is. I have also learned, however, that this is a subject where rational people can let emotion totally cloud their judgment. For example, I recently heard an interview with the late Douglas Adams (author of the Hitch Hiker's Trilogy), in which he explained that the crunch moment at which he decided that he didn't believe in God was when he heard a soap-box preacher who made no sense whatsoever. For myself, I've heard many such people, which only proves that people can be misguided, and often wrong. I've heard people badly claim that there is no God, and badly claim that there is. I've heard people badly claim that Free Software is a good and practical way forward, and others equally badly claim the opposite. The only thing that counts, is the rational, coherent considerations which make sense to you; there are false prophets in every field - they need to be dismissed as background noise. Even if someone whose intelligence you respect claims that, say, a Billy Graham rally will convince you of the living God, don't let that be the acid test. Billy Graham may not get to where you're coming from, whilst somebody else could. Similarly, Eric Raymond's claims for Open Source software may not press your button, whilst Richard Stallman's claims for Free Software do. Or vice-versa. I have heard the phrase, "Truth is where you find it". That's not what I'm saying - personally, I think that's so vague it could mean a million things. What I do believe, though, is that just because someone's failed to convince you of something, doesn't mean it is not true. For example, what if someone badly explained Pythagoras to you, leaving you thinking the person, and Pythagoras, to be a pair of idiots? Would Pythagoras' Theorem be untrue? So don't let bad advice put you off the search. So as a teenager, I explored what there was to know about this subject. I learned that the Bible is the most complex instruction manual ever - even compared to a badly-translated-from-the-Japanese motherboard manual. It can appear to contradict itself, and doesn't have a section headed "Why God Allows Suffering", nor one titled "What Steve Parker should do in 2001". That was in some ways disappointing, but then what challenges would there be for me? The point of the Christian journey is to learn more and more about the character of God, rather than just getting it right in order to pass some exam. If I could make every decision in life simply by reading the next paragraph in a book, I'd have no free will, no understanding of the choices I've made, no satisfaction from the learning process I've made, no pride in my own development, because I've learned nothing along the way, and, from all that, no spiritual fulfillment. Life's hard. Sorry, whatever anybody told you, Christianity doesn't fix that. I learned some history, and about the terrible things done in the name of God by the Cruisaders, by various Kings and Queens, how the church treated Galileo for his discoveries, and I was appalled. I also learned, however, that the church is made up of human beings, and I had learned long since that human beings are extremely strange things, and very often wrong. The Church is the Body of Christ, but the Body doesn't always do what the Head tells it. If you have experienced puberty, illness, alcohol, or drugs, then you will recognise this as a known truth. The Church suffers a kind of muscular illness because its cells - the people - are not perfect. I learned about natural disasters, and about how the West has treated the Third World, and asked why God allows such things. I've not got a complete answer to that one, but I do know that a God who didn't allow me free will, who intervened in every mistake I ever made, would be a tryannical and abusive God, who wanted robots not humans. We are fallible; we make bad judgments, such as building a village on an active volcano, or allowing powerful companies to exploit the Third World. Organisations such as Christian Aid and Oxfam work tirelessly to combat these human mistakes, as the hands of God on Earth. I learned that it is our duty to help each other, not blinker ourselves to the problems of others, then blame God for doing nothing about it. More recently, we have all been affected by the events in America on September 11th 2001. Since the perpetrators were clearly not true Muslims (having had "a cocktail of drink and drugs" on the night before the attacks, committed murder, and other offences against Islam), I shall not dwell on the non-existant inter-religious issues. All I will say, is that Superman is a ficticious character, who would most likely have stopped the planes and landed them safely, thereby fixing the short-term problem. The Living God, however, does not have a tendency to stop us from doing wrong acts. A God who would stop those planes would be a God who wants only mindless slaves, and is not interested in the long-term welfare of the peoples of the earth. Such a "Superman" God would negate my marriage, since He would also presumably stop my wife from committing adultery. My marriage is precious exactly because we both have the opportunity to sin against the other, but choose not to. My marriage is not precious because she cannot commit adultery - it is precious because she chooses not to do so. Similarly, a peaceful world would be meaningless if all acts of aggression were impossible - when we say we want a world of peace, what we mean is that we want a world where peace is chosen, not one where violence is desired, but frustrated. In all this learning and questioning, I discovered something infinitely greater, and equally incomprehensible. God didn't just create us and everything we see, He did it for a purpose, and that is because he wants us to exist, live, and love. It's not just chance, I was created - as were you - for a particular reason, and that reason is that God wants us to exist. You could have been a "surprise" to your mother or your father, but that isn't the point. You exist because God wants you to. You, specifically. He loves you. And even if your parents didn't intend for you to exist, or don't love you, God is the perfect Father. Now that's quite a radical claim. How can I say that? Surely this is a classic example of religion as a crutch? Well, no. The reason is reasonably simple. But it gets better! It's not just a done deed: Jesus died, end of story. There's the very fact that He came to be one of us at all - a King living amongst the paupers. Then there's the fact that He didn't just die, but came back to life - and was seen to die, and then seen alive, by over 500 people. You may think it goes downhill from here: he left the earth and returned to heaven. But no, His Spirit is still on earth today, and doing wonderful works!. And more still: Jesus is coming back. C.S. 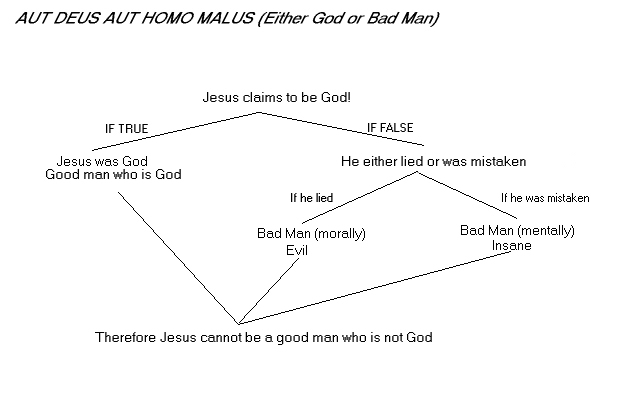 Lewis pointed out that Jesus was either a bad man, a mad man, or really who He claims to be. He went through the considerations for each one. Jeff Thompson has drawn up a nice diagram of the logic here, though I intend to improve on its logic. If Jesus were merely a human trying to set up a new religion, He went about it in a very strange way. There are many confidence tricksters who make a lot of money, fame, whatever they want, from forming new religions. Jesus, however, had no home, no posessions, and a steady following of twelve people. If that was his goal, He would be unlikely to submit Himself to a torturous death on a cross to prove a point - It would all be over once He's dead. Many people claim that Jesus was simply insane. He's the most coherent nutter I've ever heard of, and whilst it's the only other possible explanation for His willigness to die, it fails to explain how He had both the Jewish and Roman authorities so scared, or why they didn't just discredit Him. They took him seriously enough to give him the worst possible death; they would not do that if He was just insane, it would have been easier to discredit Him. The Roman Empire disappeared around 1500 years ago, Jesus Christ is loved and worshipped by millions today. Since we have the benefit of hindsight, the credibility issue is pretty clearly in Christ's favour. So that leaves us with only one explanation: He wasn't a normal human doing what he did for His own benefit, he wasn't insane. The only One who could do the things He did, and make the claims He made, is the Son of God.